International star of the best action and sci-fi films of the 1980's, Dolph Lundgren (The Expendables, Rocky IV) plays Soviet Special Force killing machine, Lt. Nikolai Rachenko, assigned to infiltrate an African rebel uprising and assassinate their anti-Communist leader. Taken into custody and tormented after the mission fails, he stages a harrowing prison escape. Befriended by an African bushman while on the run, Nikolai discovers he was fighting on the wrong side of this conflict all along. Nikolai finds the rebel army once more but, this time, he's on their side and wages bloody war against his former comrades! This action-packed controversial cult classic is now available from Synapse Films in a brand-new 2k high-definition transfer of the uncensored version, containing footage never before seen in the U.S. 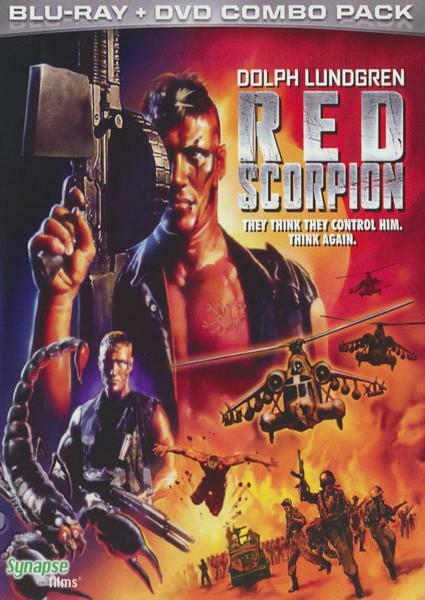 Featuring amazing performances from Dolph Lundgren, M. Emmet Walsh (Blood Simple) and the late Brion James (Blade Runner), Red Scorpion contains bloody special effects from the legendary Tom Savini (Dawn of the Dead, Friday the 13th). Loaded with interviews and other amazing special features, this disc will blow you away!